The only veg left in my fridge was a cabbage. Ah ha. Ran to the nearest grocers and got some mung beans (the beans that grow into bean sprouts) noodles or vermicelli or glass noodles as they call it here. Dug out that bag of dried shrimps. Why is it that the thing I want is always at the bottom of the chiller compartment? Grabbed that container of chopped garlic (thank God for Vero, who makes sure there's always chopped garlic). 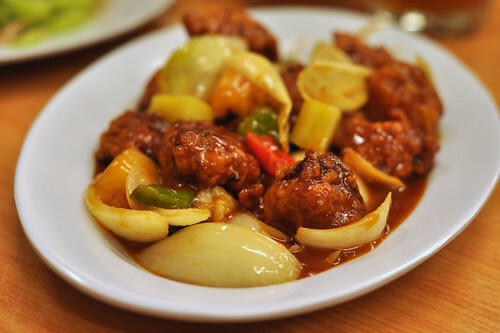 Everything into the wok, and out came this dish which is commonly served in economy buffet lunches. Sometimes I am surprised by how a 'lowly' dish can be so tasty. The cabbage is sweet and crunchy. There's the fragrance of fried garlic and dried shrimps and the vermicelli is soft and saturated with the flavors of the dried shrimps and garlic. A sprinkle of chili-lime sauce, and I can't stop eating until it's half gone. I told you. It's no-sweat cooking in my kitchen this week. Nothing creative, just plain old-fashioned dishes that some of you may have forgotten to cook in a long time. Now excuse me while I rush to watch The Little Nyonya, the only TV series from Singapore's Mediacorp that doesn't make me cringe. And best of all, Fan Wong's not in it. I don't have to watch her only two expressions--lips slightly parted and looking blank, indicating surprise or confusion or unhappiness or dejection or sadness (depending on the circumstances, you figure) and lips widely parted, indicating happiness. Six (or more) emotions, two looks. Prep: The proportion of cabbage to the noodles is up to you. We usually prefer more noodles to veg. Cut the cabbage into 2 cm slices. Wash the dried shrimps and soak them in 1 cup of water until softened. Remove the dried shrimps and keep the water. Soak the glass noodles in room temp water for 5 minutes, drain. 1. Heat up the wok, add the oil and throw in the dried shrimps. Stir continuously over medium fire until the shrimps start to turn crispy. Add the garlic and continue to stir fry. 2. When the garlic begins to turn golden, add the cabbage and the salt. Stir, add 1/2 cup of the shrimp water and cover the wok. 3. After 1 minute, remove the cover, stir fry to move the bottom ingredients up, cover and let it cook for about 1/2 minute to 1 minute. Remove the cover, increase the heat and if you like the cabbage crispy and not overcooked, add the noodles and the remaining ingredients including the water now. Cook another minute or more if you like the cabbage softer. If you like more color, add more soy sauce. Taste and season accordingly. Do not cook the noodles for too long or they will start to break up. Add one or two spoonsful of water if the noodles look dry. Unlike Zurin, I don't have a cat so I may resort to blogging about my toes soon. But I'll try to keep to food as much as I can. This is one of those no-effort-cook week for me, leaving everything to Vero. 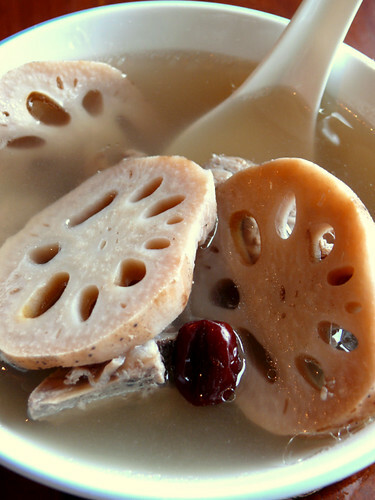 Just for those of you who never cooked lotus root soup, here's how. I know, I know, just bear with me, not everyone can cook soup. Not even Chinese soups, which are the easiest soups to cook. When you are feeling a little tired, weak and lifeless, you need a strengthening and nourishing soup like lotus root soup. You can add some peanuts (skin on) to make the soup even richer. All you need are some bones (chicken, pork or beef bones, pork being the traditional choice), dried red dates, dried cuttlefish and lotus root. Make sure the lotus root is fresh and not wrinkled or moldy (told you this post is for those who don't cook--or go marketing). Usually the whole root is put to boil and not sliced but if you are too busy, you can cut it up and chuck all the ingredients to boil in one go. The good thing about cutting the root up is that should it have a bruise or hole on its surface and some mud got in and lined the internal 'tunnels', it can be washed away. Restaurants always cut them up because that way, it is easier to cook and serve. Boiling lotus root whole has its advantage too. You can take the whole root out of the soup after its done and slice them neatly and serve separately, with some soy sauce dip. Just make sure you cut the root into half and flush out the dirt in the holes, if any. The fun thing about eating boiled lotus root is that when you take a bite and pull the root apart, it 'strings'. And it's tasty and has a unique bite that can be floury and crunchy at the same time. When I'm low on energy and appetite, I like to pour hot lotus root soup over my rice and that's a meal. This soup is especially nice when the weather's cool. Like now, when the clouds are dark and angry and the aroma of the soup fills every room. Lotus root soup on a rainy night like tonight is like a hearty bean soup on a cold wintry night. Super yum and comforting. This soup tastes even better if you cook it early and let it sit and develop the flavor. Re-heat when ready to eat. Prep: Scrape the skin off the lotus root, cut off the hard ends and half each root. Wash well to remove any dirt inside the root tunnels. Boil some hot water and pour over the bones or meat until they turn white. Pour away the water. This will remove any unpleasant smell. Soak the red dates, wash & drain. Use a pair of tongs and hold the cuttle fish over a fire until it curls and chars at the edges. Do toast it well or it won't give the soup enough flavor. You can also toast it in the oven. Wash & pick off the burnt parts of the toasted cuttle fish. 1. Put everything in your stock pot, add enough water to cover with about 2 cm of water above the ingredients. 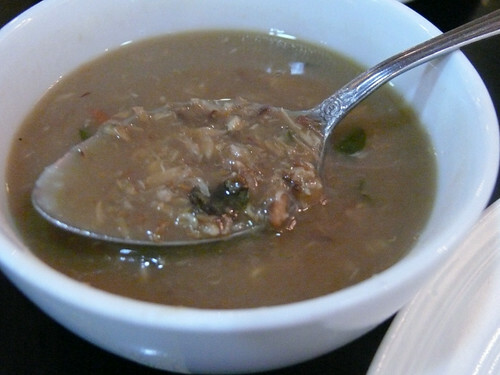 If you like the soup to be richer and sweeter, the water should just cover the ingredients. Cover the pot and crank the dial to high. When the soup comes to a boil, reduce heat to medium low and boil for 2 hours. Unless a lot of water has been lost, there's no need to top up the water. 2. Season soup with some white pepper and salt if like. Take the lotus root out and when cool, slice into 1/2 cm slices. You can put the lotus slices back into the soup or serve them separately with a flavored soy sauce like Maggi. Serve the soup hot. The literal translation of a common Shanghainese stir fry dish called chow san shxi (am not sure about the pin yin spelling for that last syllable) means 'fried three strips' which really means frying three kinds of finely julienned ingredients. The ingredients can be fresh bamboo, dried chinese mushrooms, hard beancurd, salted greens and pork although beef is fine too. My chow san shxi today was whatever I could find in the kitchen--pork, salted Sichuan veg and bamboo. 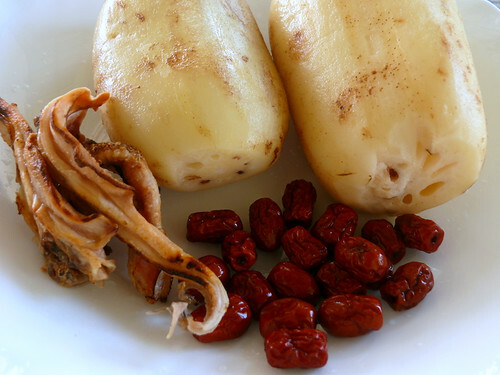 I wanted to add dried mushrooms for more flavor but that would be chow si shxi, and that's unheard of. One of my favorite chow san shxi is pork, dried mushrooms and yellow chives but yellow chives are delicate and bruise easily so they aren't imported anymore. A simple dish like this takes even more stir frying skill than you think. You mustn't have too much ingredients or there won't be enough heat to give that slightly smoky flavor, and each ingredient has to be fried according to its texture so that the result is a mixture of ingredients that is pleasing to the eye, tongue and taste buds. This means the pork should be marinaded ahead to give it flavor besides tenderizing it, the mushrooms must be fragrant and not tough and the salted greens not too salty, and everything should not be too bland or too salty. The control of the heat and time to add or dish out the fried ingredients is also important. 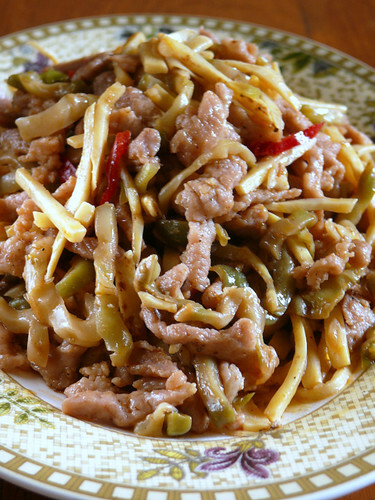 Shanghainese stir-fries, unlike Cantonese, are usually not saucy with corn flour solution. 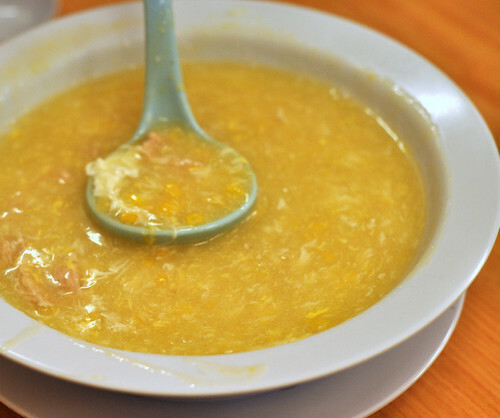 Chow san shxi is best eaten with a bowl of plain boiled rice and a good soup. For variation, you can change the ingredients but remember to balance them by color and texture and taste. 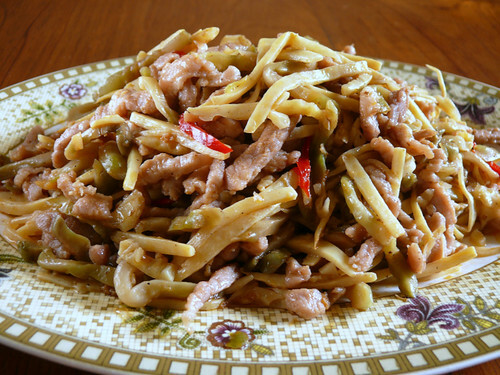 Any left over chow san shxi can be used as topping over a bowl of wheat noodles, which can be served as is or with chicken stock to turn it into a bowl of soup noodles. Preparation: marinade the meat strips with the sesame oil, salt and pepper, corn flour and water for at least 1/2 hour. If you like the pork more tender, add a large pinch of bicarb of soda. If fresh spring or winter bamboo is available, remove the outer layers and hard stem, then cut into half and boil them in plenty of water for 10 minutes. Cut into very fine julienne strips when cool. The ja chai comes cut in strips that aren't very fine so you can cut them thinner if like (but I don't bother). Do not wash because the ja chai in packets are seasoned and ready to eat, unlike the loose ja chai sold in wet markets. 1. Put 3 T veg oil in a heated wok. Add the meat, spreading it out in a thin layer. When the edges turn white, turn over and let fry a couple of seconds. You may have to rotate the wok around to get all the meat cooked. Stir and toss for a minute and dish it out. The meat should be almost cooked. 2. Add the bamboo (there should still be a coating of oil on the wok so the bamboo will not stick. If not, add a drizzle of oil) and stir fry, adding a pinch of salt and about 1/4 t of sugar. Lower the heat and let the bamboo fry for 1 minute. 3. Add the ja chai, stir well to mix the two ingredients. Now add the meat increase the heat, and stir quickly to mix. Add the wine, soy sauce and chicken powder, stir -frying all the time. If and only if the mixture looks too dry, mix 1 t corn flour with 1 T water and add to the mixture, stir-frying all the time until the corn flour water thickens and coats the mixture. Add an extra teaspoon of sesame oil, stir quickly and dish onto a plate. Some small strips of chili added will brighten the dish. Update: I am told again by LR that there's lots to see and do in Intramuros--art shops, Spanish cafes, little churches, gardens, handicraft shops etc. I believe her. Too bad we got caught in a storm. Woke up to a dark drizzly morning. A friend had sent me a message: MUST go to Intramuros. 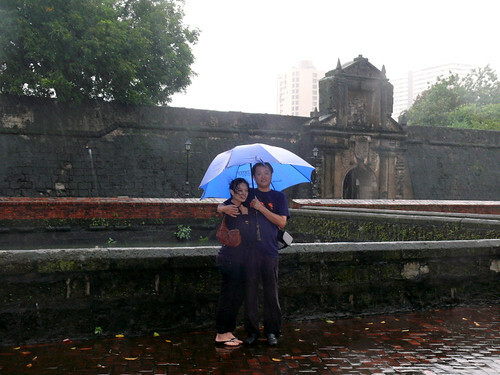 Checked guide book which recommended Fort Santiago in Intramuros too. Took a 1/2 hour taxi ride to Intramuros, the old capital of The Philippines. Paid the entrance fee of P200/RM15/US$4, and heavy rain started to pour right after we entered. Sheltered in one of the souvenir shops. Guy lent us umbrellas. Walked into the rain and wind. Wind flipped umbrella upwards, then back, totally drenching me so I ditched the umbrella. La la la ella ella eh eh eh ella. Wind 'walked' me along. It was funny. We laughed and giggled for no reason, Hub shook head. Unspoken words were: why did we wake up at 7 am, come out here, in the rain and wind, to see a lousy old fort? A few cannons, small stretches of walls and a nondescript fort. Nothing you can't get in Malacca. That LR, I'm going to get her for this. I found this on the ground. Flavor was pleasant, like soursop. Saw them in the supermarkets. too. 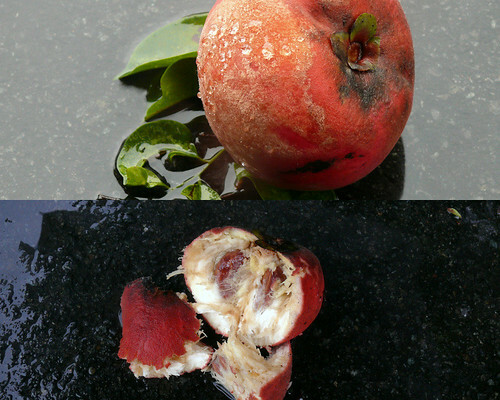 Had fuzzy skin just like peaches. Checked out the Manila Cathedral. 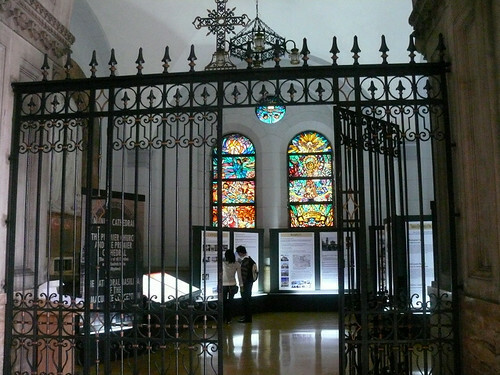 Nice stained glass and sombre atmosphere. Miss that and the Our Fathers and Hail Marys. Too much babababadededebaba in charismatic churches sometimes. Headed back to Manila. This doesn't happen in Makati but anywhere outside of the posh district: people knocking on your taxi window when the lights are red, trying to sell you things. The poor little girl was standing in the rain, knocking on Yi's window. 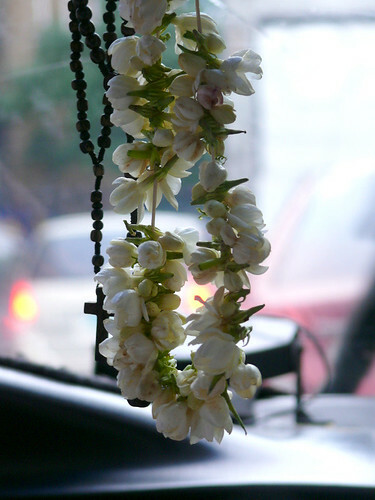 She indicated P10 but Yi gave her P20/RM1.50/US$0.40 and in return got 5 beautiful strands of jasmine buds, some of which we gave our cabbie to hang. And some boys playing happily in the flood but camera shutter lagged. 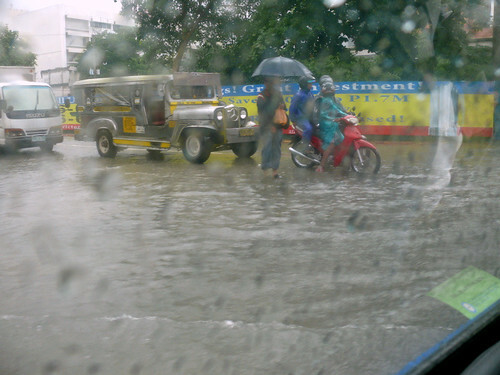 Don't know how long we were stuck in the flooded road, but from the time I woke up until we got into Makati (where the road suddenly turned dry) was 15 to 20 minutes. I got anxious. What if we had to wade through the water? I bet Yi'll enjoy it (and me too) but I'd die worrying about the diseases I'd get. But lucky for us, not a single car stalled in the flood. What engines do they use? Took 1 1/2 hours to get back to Makati because of the flood and traffic. Decided to head for Clark at noon although our flight was at 6 pm. Just in case the flood got worse you see. Airline counter not opened. No taxis in Clark, only private-owned cars. Guy wanted P315/RM23 /US$7.50 for a 10 minute ride to the nearest mall. Robber. Clark and surrounding very green and beautiful. Wondered why people rush to Manila when they can live in Clark. Saw many old white men with teenage Filipino girls. Cabbie said Clark is a favorite destination for Italians and Australians because there are 100 bars with 4000 bar girls, poor and hungry. "You've got what I want, I've got what you need." Is that exploitation or is that a ticket to a better life? Mall food again. Picked Gerry's Grill because Hub wanted meat. Ordered enough for 5, lots of pesos left. 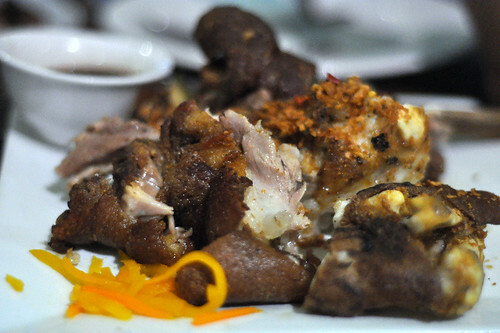 Gerry's crispy pata/pork knuckle is what made the chain restaurant famous. I found it disappointing-- sticky and chewy and not at all crispy. We bagged the leftovers and brought it home for Wey who ate all the skin and licked the bones. P415/RM31/US$8. 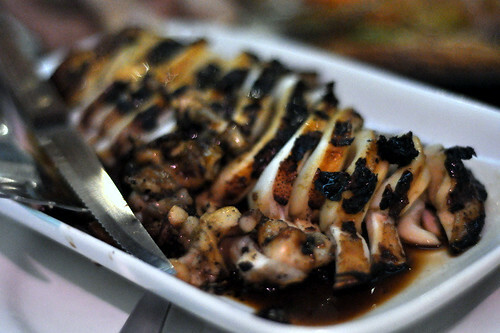 Inihaw na pusit is grilled cuttlefish P305/RM23/US$6. I had to eat most of this because the others disliked the sugary taste. This is a complaint most non-Filipinos make about Filipino food--the addition of sugar to most savory dishes. 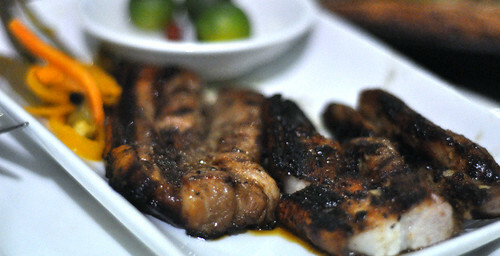 Inahaw na liempo P135/RM13.50/US$3.60 was just grilled pork belly with no special flavor. Again, a bit too sweetish for us. I ate a bowl of rice with the liempo because of the chili lime dip--so like what we get at home. Bangus ala pobre P220/RM16/US$4 was the dish we most enjoyed. 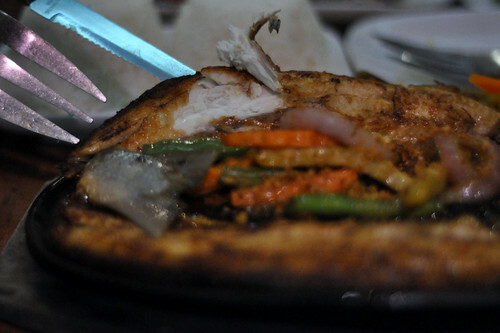 The bangus/milkfish was tender, fresh, flavorful and sweet. How do they remove the millions of bones? Overall, Gerry's food was not bad when we were eating it but when we were done, we felt a little uncomfortable because it truly was a very greasy meal. Yi said that if we had eaten at Gerry's instead of Mangan on the first day, we would've had a better impression of Filipino food. I agree but then you can't go wrong with grilled food, ya? 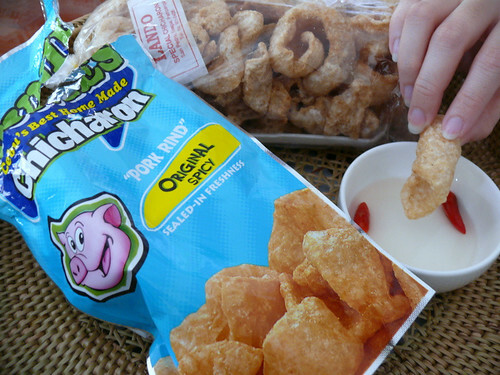 Chicharon, crispy pork rinds , is a very popular snack. They eat chicharon with a vinegar and chili dip which was quite okay especially if you like the flavor of pork fat. I didn't find it very tasty and in fact after 3 pieces, my mouth and throat were parched, leaving me gasping for water. The home-made chicharons in clear plastic are way better than the fancy packaged ones because their rinds are fluffy-crisp while those packaged for the supermarkets are hard. Flight back was terrible because of turbulence. I was strapped to my seat and gripped the armrests for the duration of the 1 1/2 hour flight. Hub slept like a baby all the way home. 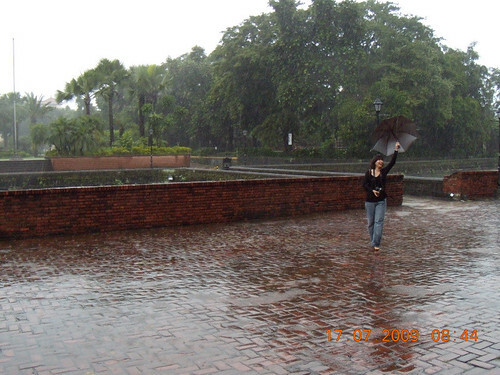 Next day, papers said Manila was shut down (public holiday declared) at 8 am the last day we were there (when we were prancing in the fort) because of Typhoon Isang which whipped the northern part of The Philippines. We went through a storm and didn't know it. And that's all folks, on my Manila trip. Note: We should've got a local guide. I think that makes a lot of difference especially food-wise. Then again a guide wouldn't be able to change the weather. And therein lies the sad fact about the beautiful islands of The Philippines: They are plagued by typhoons, earthquakes, bad management and corrupted politicians. But who am I to say that when we have our share of unnatural disasters too. There are reasons why people don't go to Manila. The food is not great, the traffic is hell, the shopping is mediocre (I could think of worse adjectives but I shouldn't be too harsh; they need the tourists) and there's only the Ayala Museum to dive into if you want something cultural. Then there's the weather. Of the 3 days we were there, two were rainy days due to a typhoon called Isang. I'll tell you about Isang tomorrow. The weather on the first day was fine but we went shopping. All day. The second day, we woke up to rain and huge traffic jams but that was okay because we lived only 5 minutes from the Greenbelts. Since we had done the Greenbelts the first day, we decided to go further, to Rockwell Power Plant Mall. I don't know why it's called power plant because it looked like a regular mall to me. I like Rockwell Mall. It is small, elegant and pleasant. It has top designers shops like Ferragamo and brands like Zara but just as in KL and Singapore, the labels are there but the selection is very limited. I think branded goods are slightly cheaper in Manila than in Hong Kong. We were lost again when it came to lunch. What can you eat in a mall? It was either Filipino-American fusion or fast food. I was thinking of trying California Pizza but the others wouldn't touch Italian after last night. The only food we all agreed on was Japanese shabu shabu, again something we didn't expect to eat in Manila. 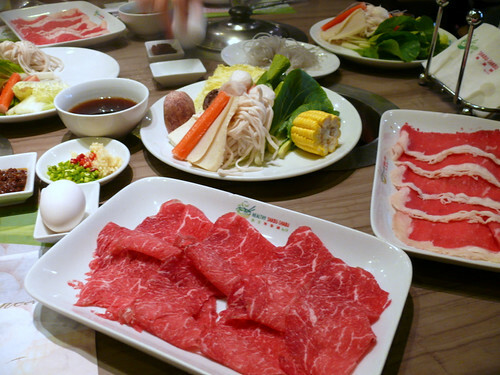 We are true Chinese to the core, because we felt so good eating Japanese shabu shabu, which is like a poor man's version of the Cantonese steam boat. The soup and the lack of oil were refreshing and blandness was welcome when your taste buds are tired. I liked the wheat noodles the most. Chewy and smooth. Shabu shabu + halo halo = happy happy. Rockwell is small and isolated so we took a taxi back to Glorietta and went to the supermarket for fruits. We asked a lady where to get the best lechon, and she asked what lechon we wanted, chicken or pork. I thought lechon was roasted pork. Same thing happened when we asked a taxi driver, who wanted to know if we wanted lechon baboy (pork) or lechon manok (chicken). I've since found out that lechon in Spain is suckling pig but in The Philippines, lechon refers to the roasting method of cooking. So when in Spain, ask for lechon but when in The Philippines, ask for lechon manok or lechon baboy or lechon baka (beef). 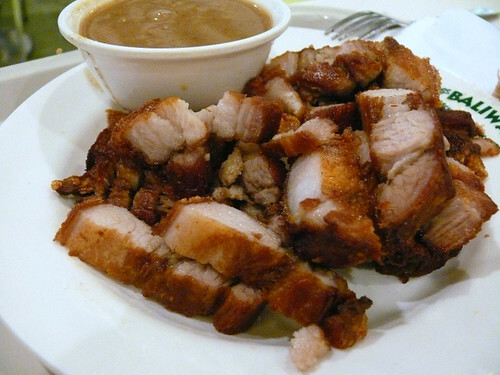 But to confuse matters, lechon kawali is pork fried in a kuali (wok) so I think the word is pretty much misused. Anyway, the lady directed us to Lydia's Lechon located in the basement of Landmark. There were lots of other places for lechon but we'd have to go out of Makati. We went to Landmark's food court in the basement but couldn't find Lydia's, which was unfortunate because I've since found out that the lechon in Lydia's Lechon chain of restaurants is the most well-known in Metro Manila. We settled for the Baliwag lechon, but they were out of lechon baboy so we had the lechon kawali, which like I said earlier is not roasted but deep-fried. Little pockets of well-manicured gardens that connect the shopping and office buildings of the Greenbelts. Metro Manila is very green, with lots of nice medium-sized trees lining their streets. Baliwag's Lechon kawali was tasty, tender, lean but not dry. The skin though was thin and hard-crispy, probably because it was deep-fried. I doubt it was a suckling pig because there was too much meat. P165/RM12/US$3.15 plus a bowl of rice and a plum sauce dip. My only regret about the trip now is that we didn't go to La Loma in Quezon City where rows of lechon baboy are displayed outside the restaurants. We thought we could eat lechon baboy anywhere in Makati but everytime we asked, it was sold out or unavailable but lechon kawali was always on the menu. I think that's because lechon kawali is just pork belly which can be fried to order anytime while lechon baboy is cut from a whole roasted pig. We never got to eat lechon baboy. The next place we went was to satisfy my daughter. We were told that for cheap clothes and shoes, we should try Greenhills. The locals, such as the lady we spoke to and the cab drivers, insisted we shouldn't go there but Yi was curious and she loves cheap bargains so we took a cab out to Greenhills. Taxi rides are very cheap. A half-hour ride costs about P100/RM7/US$1.90 and all taxis are metered. But never sit in front. I did once and couldn't wait to get out. Most of the roads are not marked and a 5 lane road can fit in 8 lanes of cars, each one 1/2 foot apart and racing at 80 kmph in heavy traffic. Coming from small town KK, taxi rides in Manila are terror rides. I wouldn't recommend jeepneys either. Their drivers are either crazy or seeking reincarnation. What can I say about Greenhill? It was a waste of time for me, but Yi picked up a couple of P130/RM10 T-shirts. Dinner was in Greenbelt again. Hub wanted to treat us to a good dinner since he was happy that after 2 days, we still had half the P26000/RM2000/US$540 we brought with us. I got the feeling that I've made the stupidest decision to shop in Manila and not Hong Kong this year. In the end I didn't buy a single thing except for dried mangoes and chicharon (crispy pork rinds). Dang. Zuni Restaurant & Wine Bar was rated Manila's top restaurant by The Philippine Tatler magazine, a fact that was printed, framed and placed at the door. The restaurant did look very elegant, and it was full with expatriates dining al fresco next to a beautiful strip of garden. Two doors from Zuni was a Japanese restaurant which was packed earlier. Love the garden. Hub had the US Top Blade P615/RM46 /US$12.50 before tax and service. It was quite flavorful. My prawn and dried tomato bisque was too tomato-ey while the soup of the day, mushroom soup, was the usual creamy stuff. 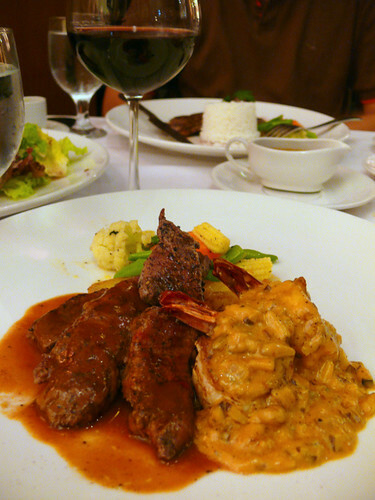 With a moreau rouge from France, the meal was P2690/RM199/US$54 which was not bad considering the high rating of the restaurant. Maybe because the ribs and prawn bisque disappointed me so I rate this place 7/10. 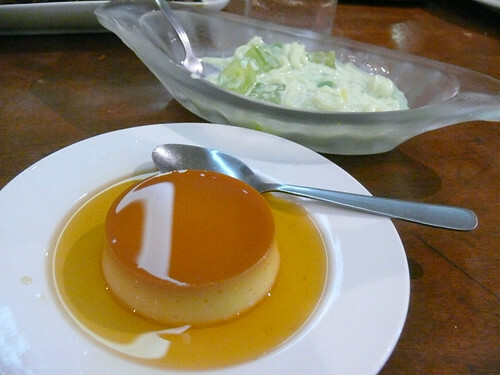 We skipped the desserts which were all western cakes and saved our stomachs for Manila's famous ice cream and leche flan and planned to listen to the lounge music at Shangri-la Hotel, which was nearby. However, both Yi and I could only manage one block before our legs gave way. We'd been walking from 10 am until 11 pm, with only meal breaks in between. I love it when my thighs quiver from fatique. No pain no loss. For once we didn't have 5 meals a day as we usually do when traveling. Both Yi and I lost our appetite, partly because we had a slight flu and partly because of an awful lunch. 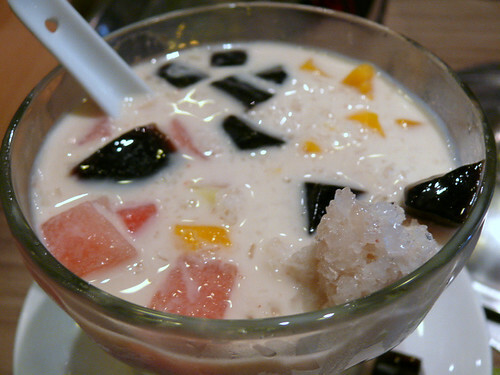 We do love Filipino mango juice and their halo halo, which is like Malaysian ABC (shaved ice with beans and jelly mix) except halo halo has fresh fruits. I like the cut fresh fruits stalls at the entrance of their supermarkets. You scoop your own mix of fruits and pay according to the weight. The only fruit that disappointed was their papayas which were yellow-orange, totally bland and flavorless, unlike Malaysian papayas which are deep orange, fragrant and sweet. The thing about confining ourselves to the CBD was that we only got to eat at malls and malls only have chain restaurants which to me are a waste of time. I wanted to eat at a family restaurant called Gateau de Manila in Quezon City but Hub wouldn't venture out of Makati, especially at night. 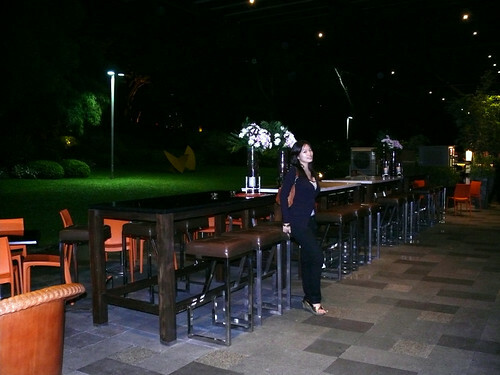 Makati's malls are filled with American-Filipino chain restaurants but between Greenbelt 4 and 5 are many fancy restaurants and bars. We finally decided on Marciano's. 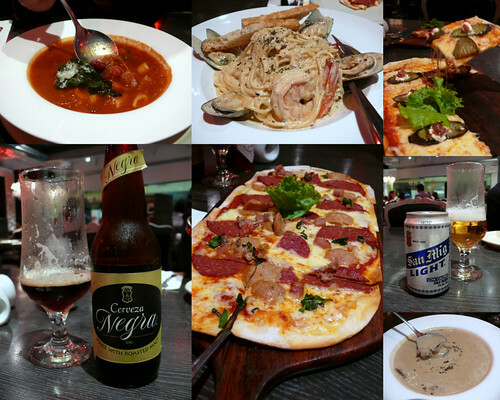 We never thought we would resort to Italian food in Manila but after that lunch, we wanted to play very safe. I wanted Spanish but the others objected violently. No Chinese food either, because Filipino Chinese restaurants had Pearl S Buck-kind of names. Dragon Inn, A Thousand Flowers, that sort of stereotype names. You can tell an authentic Chinese restaurant by its name which is usually the pin yin version of the Chinese meaning, such as "Long Ke Jan" for Dragon Inn. The food at Marciano was just okay. Bill was about P1200/RM90/US$ .The Mediterranean pizza tasted of coconut oil so I lost my appetite. Ah well. Time to loose those 2 kgs. Jollibee's is their most successful contender to McDonalds'. We used to have one in KK but it closed despite the large Filipino population here. Yi bought some fries from Jollibee and sure enough they tasted of coconut oil, quite faintly, but it was unmistakable for me. I can take the whiff of coconut oil in Revathi's or Muthu's hair but not in my food, no. Manila must've had its glory days in Marcos' time because most of their skyscrapers look like they were built in the 70s. The only modern and reasonably aesthetic building I saw was that of the Union Bank. With the English signs, American chain restaurants and older buildings, Makati almost feels like some city in the US. But take a taxi ride out of Makati and you will suddenly cross the line where the CBD melts into slums that are packed together on top of each other, with shacks made of cardboard, wooden planks and rusty zinc sheets. I just can't understand why the government can't provide lost cost houses for the people. There are no high rise apartments for the poor, just hectares and hectares of slum with dirt streets. Hub said it looked like Jakarta, another city you needn't visit. I think it was Newsweek that did a feature on the happiest people in the world years ago and the happiest people in Asia according to their survey was the Filipinos. 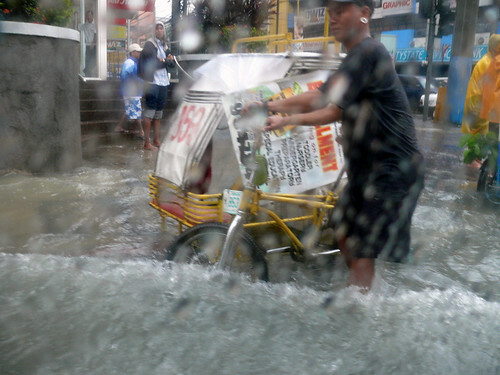 You remember that cover photo, the one with a Filipino playing a guitar standing knee-deep in water as his house floods. One reason for this happiness, I read somewhere, could be that being Catholics (there were statues of Jesus Christ everywhere; I nearly didn't recognize this Jesus), Filipinos have this belief that life on earth is full of suffering and is only temporal. Another reason postulated is that their extreme poverty keeps them from high expectations and so they appreciate everything, unlike the Japanese who, despite being the most advanced economically and technologically in Asia, are the unhappiest people because they have so much from young and so they expect more. Which is why I disagree with the new research results that showed that the Danes are are happiest people on earth on account of their easy accessibility to education, wealth and good health. I think the survey is flawed because it assumed that people who have a high quality of life are the happiest. The answer should come from the people and not from assumptions based on material achievement. The Filipinos are proof that you can be happy (or happiest) despite poverty, just as the love songs tell us that we are happy when we are loved not when we have a million $ in the bank. So based on that and our declining standards of living, I can see us Malaysians becoming an increasingly happy people too. We may even be the happiest people in Asia soon, happily banging on our gongs while haze choke our lungs. But really, I think the main reason for Filipinos' happy state of mind is their closely knitted families. The Filipinos are very family-oriented and have a big network of relatives. It is well-known that you don't marry a Filipino, you marry the whole family including the uncles and aunties and nephews and nieces, distant cousins and yet-to-be-born relatives. Everybody looks out and helps each other. One of the things I like about Filipinos is their friendliness and eagerness to help. Of all things, I am impressed most by their washrooms. Hospital-clean. Probably the cleanest public toilets in the world. Not a drop of water on the floor or mirror or counter or sink, and not a teeny bit of unpleasant smell. There is a cleaner in every toilet and she will clean nonstop while singing (very well too), unlike the toilet cleaners in KK who are more like minders who will stay outside while the inside is flooded, stinky and blocked. The washrooms in Manila were so squeaky clean I think I could eat in them. As a traveler, clean washrooms are my top priority. I have complained about it before and I will again: I don't see why we need to have hoses in our toilets. People who use public toilets should be expected to use paper, whatever their religion. Do the washing at home, keep the toilet floors dry and s--- free. If this practice of providing hoses and water is not stopped, we will never have clean and dry toilets. The next thing we liked about Manila is that everybody speaks good English. So okay, they curl their 'r' too much for us (while we drop our 'r' completely, do you notice?) but at least we can communicate. I know there are Filipino readers out there but I'm going to relate a hilarious incident. Have you ever noticed that Filipinos can't or don't pronounce 'f'? The first thing Yi said when we arrived was "Everybody speaks like Marilou". Marilou was our first Filipino maid, the best maid we had who could mind the kids, clean, garden and even bake our birthday cakes. Marilou curled her 'r' and didn't have 'f' words, literally, in her speech. We were in a cab in Clark, Hub in front and Yi and I at the back. Cabbie: What time is your plight, Sir? Hub (unfazed): Our flight? Er, six but you come at four 0'clock. Cabbie: Pour o'clock? Okay, I'll come at pour o'clock Sir. Hub (unfazed, straight to the point): How do you say Filipino? Can you blame us for laughing?! I wanted to hear him swear. But seriously, Filipinos speak the best English in the Asean region and Malaysian English ('Manglish', how apt) is at best "half bucket". My first trip to The Philippines was in the early 80s. I went with 3 other girls on a guided tour and we enjoyed ourselves. We did the usual Filipino tour in the 80s--checked out the museum that Imelda built and attended a ballet, saw a traditional bamboo pole dance, went to Baguio City, had a morbid drive through their Chinese cemetery (in which the dead were kept in fancy 2-storey houses, complete with gates and furniture and their family members would picnic there playing mah jong), paddled a boat in a lake, ate their famous pork dish, lechon kawali, and shopped at the top departmental store Rustan. In the years since, I've never wanted to go back to Manila. A week ago, we were tossing the coin between KL & Krabi in Thailand and Manila. Since we could only have a couple of days off, we decided on Manila, lured by the shopping that we were told was very very good. Excited and with open minds, we arrived late Friday evening at the airport in Clark two hours behind schedule, an AirAsia norm. Clark, which used to be an American air base, and its surrounding area looked just like any small town USA. There were hardly any houses, just lots of lush green trees and flat green fields (the land is rich from the volcanic ash of Mt Pinatubo, which erupted in 1991) and the one-storey malls with American stores like McDonalds and Shakeys' and the fact that they drive on the right side of the road made me felt like I was in Pennsylvania. Earlier, straight off the plane, I went into the washroom of the airport and was surprised by the cleanliness. No water on the floor (shame on Terminal Two, KK), absolutely no smell and no litter, not even shoe prints. The bus ride (350 pesos) at 60 kmph took 1 1/2 hours from Clark to Manila. I would have driven there in 1/2 hour. Hub had booked a service apartment in Makati, the financial and business district and the only safe and decent district of the city. He figured that a service apartment would give us more space than a hotel room. The lobby of Perla Mansion was laid in marble and the wainscoting gave the place a classic continental look. But when we stepped into our apartment, we were hit by a strong smell of bad cheese, like baby vomit. We looked at five apartments and none was decent enough (bad smell, small beds, tacky mirrored bedrooms). I was quite upset and Yi was blue from withholding her breath so Hub firmly insisted on a better room in another building that the same management was in charge of. The polite bellboy then took us to another building a couple of doors away, the BSA Suites. The apartment was very clean, odorless and spacious, except the bed was queen-sized instead of king and the sitting room furniture though 1980-ish, was still new but uncomfortable and stiff. We took it, too tired to even shower. I hoped it wasn't a sign of things to come for the rest of the trip. 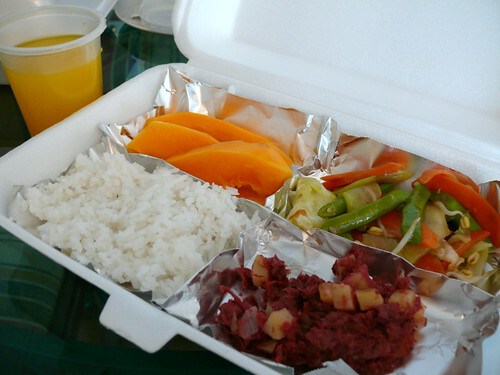 Breakfast provided on Day 1 was bad, with red corned beef, so Hub cooked instant noodles which we gobbled. I had laughed at him for bringing the noodles. Now I've learnt a lesson: always bring some. Breakfast Day 2 was so bad (the bottom of the sandwich was soaked in coconut oil), Yi and I shared our last packet of instant noodles. Hub went out for McDonalds'. Sausage McMuffin was only P25/RM2 each. We hit the malls when they opened at 10.30 am the next day. We walked through SM Mall and Glorietta Mall, both mid-range busy malls that bored us. 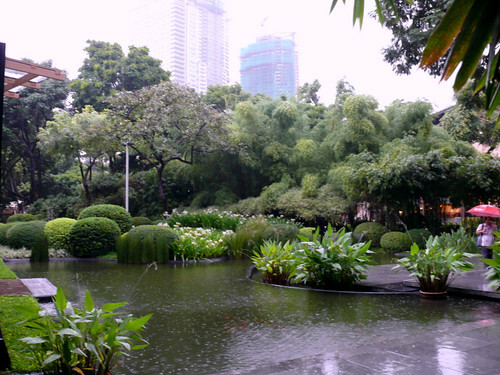 In the afternoon, we discovered the Ayala Center, commonly called the Greenbelt, numbered from 1 to 5. We liked the Greenbelts 4 & 5 which are modern shopping buildings joined by beautifully manicured gardens with al fresco restaurants. I apologize to any Pinoys out there. I am ignorant about Filipino food and I know I shouldn't make a sweeping conclusion based on one meal from one particular restaurant. And our impression of a new place would be much better if we have local people or guides to tell us where to go and to what to eat. But I do write what I experience. And after Manila, I can't decide which I hate more, Greek or Filipino food. All of us lost weight after 3 days in Manila. We wanted Filipino food and was directed to Glorietta 5. It was about 11:30 am and Gerry's Grill next to Mangan was filling up but there wasn't any customers in Mangan. I chose Mangan because it looked homey while Gerry's looked very much a American-Filipino chain restaurant. It was a meal we'll laugh and shudder about for a long time. 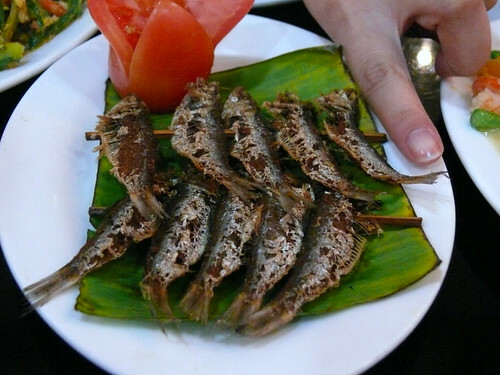 Recommended by the waitress, fried tawalis (P51) turned out to be deep fried crispy fish, smaller than a finger. We could eat that except that at first bite, Yi and I both tasted coconut oil which repulsed us. It was then we realized that the offending smell in the apartments , their lobbies and malls was that of coconut oil. Now while I love coconut milk, I can't stand the oil, especially when it is rancid. Gatang sitaw at kalabasa (P55) was a mistake. 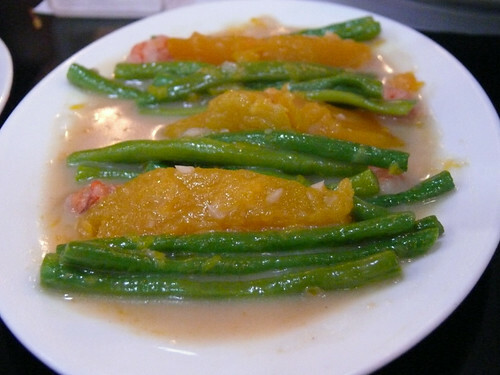 I wanted gatang sigarillas (winged beans). Cooked in coconut milk like some Malaysian veg dishes, it was okay but not special. 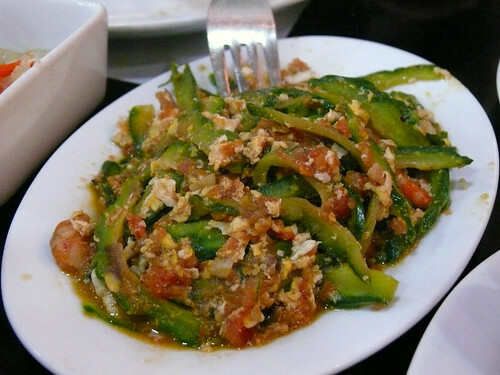 This was a dish my former Filipina neighbor used to cook, lagat ampalaya (P55), bittergourd with eggs and tomatoes. 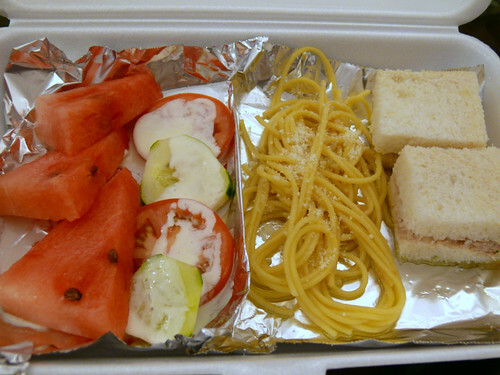 The portion of all the dishes were very small, like appetizers, which was just as well. 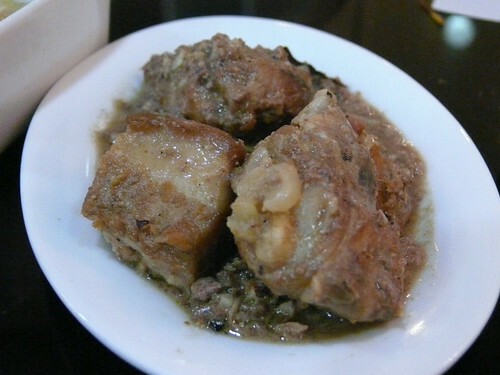 Adobong baboy at manok (P79) was pork and chicken in a vinegar sauce. Adobo/adobong is one of the more famous Filipino dishes so I was surprised by the lack of flavors and taste in this dish. By now we were totally downcast. Yi mentioned that maybe Anthony Boudain's job isn't as fun as it looks, and I totally agreed. The next dish confirmed it. 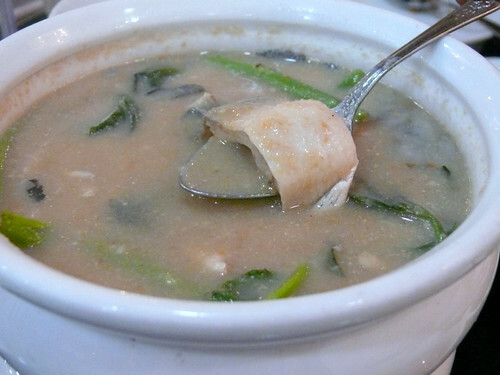 Sinigang na bangus sa babayas (P185) is a famous Filipino soup made with bangus, also known as milkfish also known as fish with a million bones, and tamarind, a seed that gives a sour-sweet taste. One of my friends has taught me to cook this soup with fresh tamarind and another has given me Knorr's sinigang soup bases and the resulting soups are mild and refreshing butMangan's sinigang babayas is the mother of all weird soups. It came hot, giving off wafts of a strange smell that blew in my direction, immobilizing me and my appetite. Hub took a bowl and said it wasn't so bad and that the bangus (which we do love to eat once in a long while at the coffee shop next to Cathay Cinema) was very tasty. Yi took A sip and spat it out, making such horrible noises and faces that I felt embarrassed for the poor waiter who was politely watching us. She took another spoonful at her father's urging, pressing her nose with her fingers. I took my spoonful. It was quite tasty, sourish and savory but that smell was hard to take! I managed about half a bowl to my daughter's surprise. Actually I did that to show her that I was open to new tastes. Hub reminded her that I drank yak tea in Sichuan. I am open to trying new food but really, sinigang babayas this strong is one of the worst soup I have ever tasted. Yi's description that it smelt like saliva and sweat was spot on. This was the best-tasting dish of the meal, beans and fish soup. 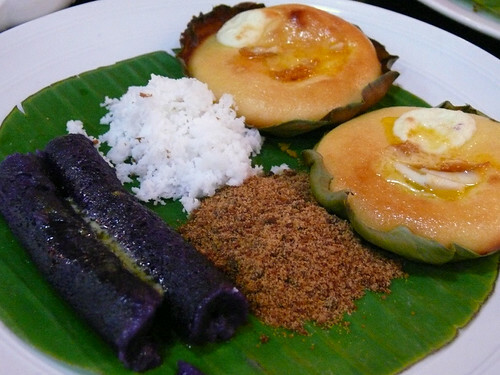 A sampler plate of dessert that included bibingka puti with salted egg and puto bumbong. Didn't taste good or bad. That meal so put us off that we decided to break our rule of eating local food. But to be fair, I'm sure some of our Malaysian dishes can be very repulsive to the uninitiated tastebuds. Assam laksa. Belacan. Durian. Salted fish. Some food are universally accepted at first bite, like ice cream, hamburgers, pizzas, fried rice and spring rolls, but some are just what you are used to. And that, I think, is the reason why Filipino food isn't and will never be world-popular. It just isn't that palatable unless you grew up eating it. We were looking forward to going to Hanoi but my daughter has to return to Melbourne earlier because her landlord gave notice, leaving her frantically searching for a room. I suddenly felt weak, feverish and nauseous last night. I think it was the local oysters last week. Right now I've lost all appetite and am not even looking forward to traveling. In a way it's good because it makes me more careful about eating out. But we made an impulsive move last Friday after speaking to a friend who has been to Manila many times. 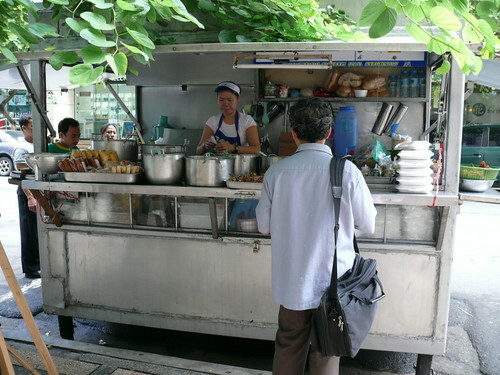 She highly recommends the city for its food and shopping ("Better than KL"). Friends who know we are going to Manila tell us not to miss the pork dishes and to stay within the Makati area, making me nervous. The first and last time I was in Manila was about two decades ago, and all I remember is the disparity between rich and poor. But that's the case with most Asian countries--Singapore, Hong Kong and Japan being the exception. So we're off to Manila this afternoon. Tell me if there are places and food we cannot miss. Be back Friday. Have a great week! 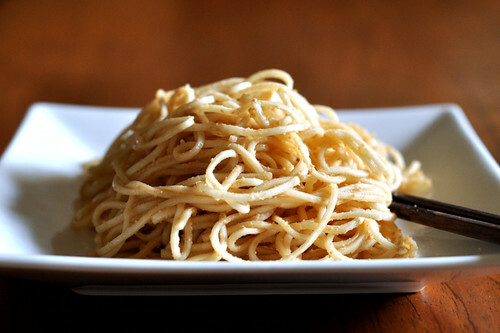 This is a very simple and common noodles dish in Shanghai homes, usually made with sesame paste instead of peanut butter. I haven't tried using sesame paste/tahini because I once bought a bottle and it was rancid. I think Korean grocers carry very high quality sesame paste which would be perfect for this dish. I wouldn't use Middle Eastern tahini though, because Oriental sesame paste is smoother, like peanut butter, compared to Middle-Eastern tahini which is coarser and a bit raw. The first time I ate noodles tossed in peanut butter was when I was in 6th Aunt's place in Hong Kong. I was on the way to the eastern states of the USA and unknowingly pregnant with Ming. The peanut butter noodles tasted awesome (was it the pregnancy? ), and each time I returned to Hong Kong, I'd ask 6th Aunt to cook it for me but she'd usually whip up a feast without peanut butter noodles because "those noodles are too ordinary". I finally got her to cook the noodles for me last month when she was here. She was disappointed with my peanut butter (Jiffy). In Hong Kong, you can get salted or sweet peanut butter and for this dish, salted peanut butter is preferred. I too found Jiffy unsuitable for this recipe because although it is good as a bread spread, it didn't make a very smooth sauce. Since I can't get the right peanut butter for this recipe, I'd do with sesame paste next time. The noodles are usually eaten hot but I prefer them cold, especially in our weather. However, eaten cold, the peanut butter makes the noodles too pasty so maybe they taste smoother if eaten hot. Try it and tell me. You can make it a simple, complete meal by adding cooked shredded chicken and some veg like cucumber strips or bean sprouts. I love my noodles dishes with chili oil and fried Sichuan peppercorns and they truly spike up this dish. 6th Aunt used water and chicken stock powder, but I prefer to just use chicken stock. She also cooked by taste and sight, so you'd have to do that too, adjusting the amount of the ingredients to your taste. 1. For about 300g dried noodles, put about 6 T peanut butter/sesame paste into a bowl. Add 2-3 T chicken stock to the sesame paste/peanut butter, stir well to mix. Adding the stock by the spoonfuls gives you control over the consistency of the sauce and also makes it easier to mix evenly. Continue to add the stock by the spoonful, stir well to mix until smooth, repeating until you get a sauce that is the consistency of pouring cream. Add a little salt and white pepper. 2. Make sure noodles are cooked el dente. Drain well and put noodles into a bowl. If you are eating the noodles cold, cook the noodles before you make the sauce. 3. Drizzle some light soy sauce, sesame oil and black vinegar (very little) if using, over the cooked noodles, mixing well. 4. Pour the peanut butter/sesame paste sauce into the noodles, tossing well until all the noodles are coated. If there's not enough sauce, you have to make more. 5. 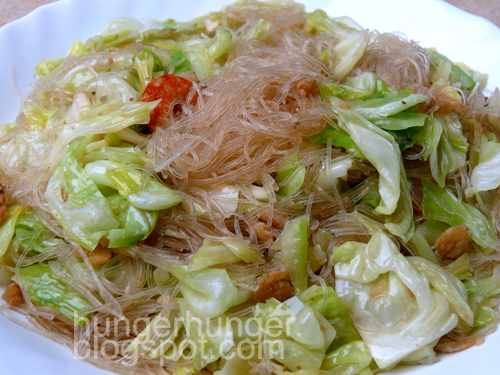 Garnish with the shredded chicken and cuke or bean sprouts. Serve chili oil separately. *if you prefer a less creamy sauce, reduce this to 1/2 cup. 1. 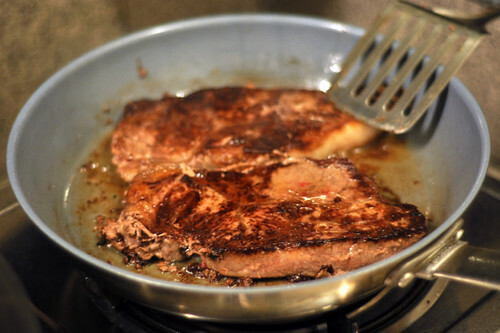 If cooking one steak, do not wash the pan or remove the oil after frying your steak. Scrape off the burnt bits but if they aren't burnt, leave them because they add flavor to the sauce. With a low fire, fry the shallots until they are soft and transparent. Add the black pepper, fry, increase the heat and add the wine. If frying more than one steak, put some veg oil or butter into a pan and fry the shallots until soft and add pepper, fry 2 sec, then the wine. Increase the heat to medium. 2. When the wine boils, add the cream, garlic powder if using and the beef stock and let it boil for about 7-10 minutes until medium-thick. Taste and season with salt. 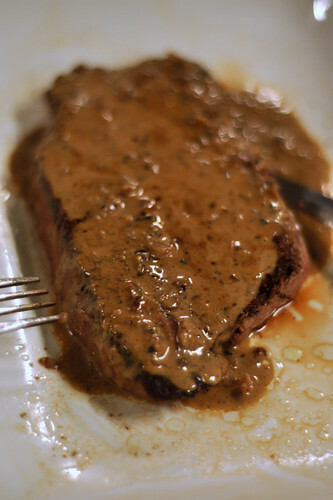 If you like the sauce dark like the restaurants', add some browning sauce or dark soy sauce, which is more convenient and cheap and doesn't alter the flavor of the sauce much because you need to add just a little, say, 1/2 teaspoon. p.s. like i said in my post Gyu The Cow, good steaks should be eaten plain with salt n freshly ground pepper. If you must have a sauce, it's good to have it on the side as a dip and not douse the whole steak with the sauce like I did. Update: I have been informed that Wagyu imported into this country are those of Grades 6 to 9, 9 being the most marbled and priciest. 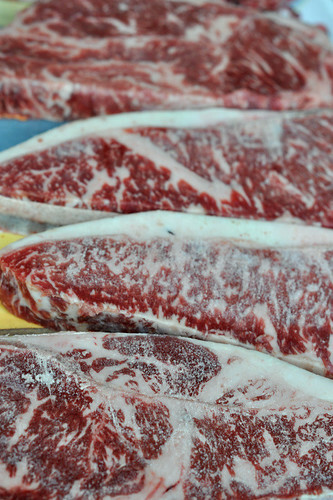 It is recommended that Grade 6 (which may be graded as 7 by other wholesalers, making it hard to compare the price) be eaten as steaks while Grade 8 and 9 Wagyu are very marbled and don't give a bite so they are best eaten shabu-shabu or sukiyaki style. 'Wa' means Japanese, 'gyu' means beef in Japanese. Wagyu is beef from special Japanese breeds of cow which are now not only reared in Japan but also in Australia and the USA. Prized and craved for their marbled fat, which is due to genetics and the special feed and treatment, Wagyu has more mono-saturated fat than regular beef, meaning it is 'healthier' to eat than regular beef. Wagyu is the most expensive beef in the world, Kobe Wagyu (Wagyu from cows raised in Kobe) being the most famous. The wholesaler only sells Australian Wagyu in 5 kg blocks, so three of us shared one block. At a discounted rate of RM150/US$50 per kg for Grade 6+ Wagyu, I got 8 pieces for RM330, Rm41.25/US$11.50 per piece, very cheap by restaurant standards. I waited until Kid No 1 and 2 came back on holidays to cook the Wagyu, (Kid No 3 had by then cooked 2 pieces of the steaks for his own consumption) which I have eaten in Japan and Shanghai but never cooked before. Since my Wagyu was cut into steaks, I figured that was the best way to cook Wagyu. I was wrong. 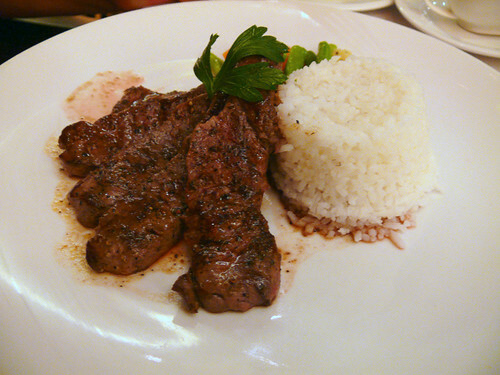 Wey recommended pan-frying rather than grilling steaks, based on his experience. He said somehow pan-fried steaks taste better. I believe the guy, so I pan-fried the 3/4" wagyu steaks for 5-6 minutes on each side for my mom and niece who didn't like rare steaks. The remaining steaks were again sprinkled with a pinch of salt just before frying and black pepper was freshly cracked over them during frying. I fried them about 4 minutes each side and they were rare, a little too rare but we didn't bother to cook them again because they tasted so good. Just before serving, they were given a small splash of red wine and sherry. I also made black pepper sauce, an Asian favorite. We agree that Wagyu is best cooked rare to medium rare than well-done and medium. 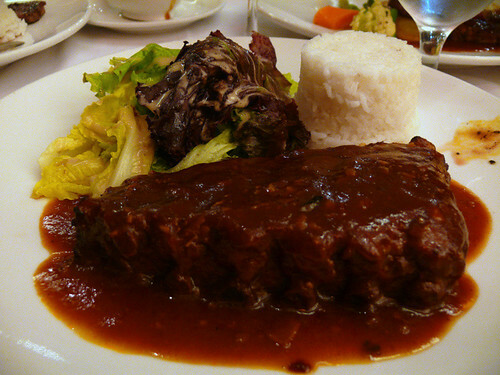 When cooked to medium-well, the beef tasted like good ordinary beef, only more tender. 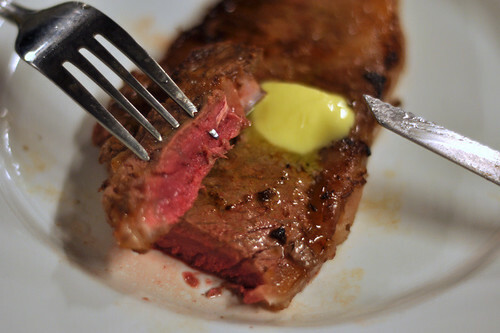 When done rare, each bite released juice that was buttery and smooth, after which you taste that bite of flavorful, tender meat. We ate very fast, not talking, finishing all the steaks first, clearing our palates with a great Spanish red wine in between bites, then dutifully ate the sides: taters and salad. Which actually was the right way because the meat was so good nothing else on the table was worth eating. Juicy, tender, flavorful and buttery-smooth is the only way I can describe Wagyu. I obsessed about Waygu all night after that, thinking about ways in which this wonderful meat can be cooked to its best gastronomic potential. I felt that Wagyu shouldn't be eaten in a large chunk. First of all, because it was a big piece of steak, it got cold before I could chew half of it. With so much (cold) fat in it, I felt rather uncomfortable by the time I got to the last bite. Second, the seared part of the meat, the surfaces, were very flavorful but cooked as a steak, the surface area was limited. I remembered the thin slices--about 1/6" or 1/3 cm thick--of Wagyu in a Korean restaurant in Shanghai and how flavorful and delicious they were, grilled over a fire at our table and served with a flavored salt dip. That was one way to maximize the grilled surfaces of Wagyu, and I wished I had more Wagyu to experiment on. The next day, I searched for my copy of 'The Man Who Ate Everything' by my food idol, Jerry Steingarten, because I remembered he ate everything and wrote about it. I wish I'd kept the food articles in all those Vogue magazines that I used to buy when Steingarten was the food writer. It wasn't for the silly fashion that I bought Vogue: I would read Steingarten's pages, savoring every sentence, before I looked at other pages. Steingarten too had no idea what to do with his Wagyu so like me, he also made steaks out of them, and like me, he wasn't sure if that was the best way to eat Wagyu. But his job paid obscenely for him to find that sort of thing out, so he flew to Osaka, Japan to eat the best Wagyu dinner in a restaurant called Devon Steak (I know, ironic). At Devon Steak, Steingarten ate Wagyu 2 ways: raw slices ("tasted more like tuna than beef") and teppanyakied strips, eaten with dips of soy, garlic, honey, miso and a spicy house dip. Steingarten declared that it was the best beef he had ever eaten. That confirmed my suspicions, that Wagyu is to be cut into thin strips (but not paper thin unless it's for shabu shabu or sukiyaki, which was how we ate Wagyu in Tokyo and my memories of that meal is that I couldn't taste the beef because it was cut so thin and there was so little to go around...) or even cubes, sauteed on all sides not only to get the meat juice caramelized, as Steingarten put it, but also to sear the wondrous streaks of fat so that the flavor of the buttery fat is released. Cooked as steaks, the fat inside do not get seared which is a pity. 1. Have the Wagyu cut into 2" steaks. Thaw the steaks in a cool place for about 2 hours. Surprisingly, very little blood will seep out, maybe because there is more fat and less meat compared to regular beef. 2. Rub salt all over just before cooking, pan-fry them on a very hot griddle/grill plate until they are browned and crisp, turning once only, then slice them into strips or small cubes on the grill plate so that all sides can get seared, then sprinkle some freshly cracked pepper over, and finally douse them with brandy like they did at Devon Steak, count a few seconds for the alcohol to evaporate, then serve immediately. Mmmm. Heaven. 3. 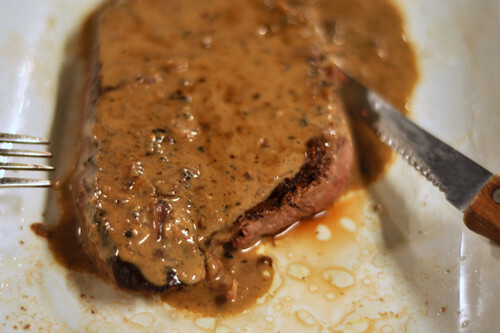 The fat can be left on the steak or cut off and sauteed separately. Be brave and taste some if not all, because Wagyu fat is the softest, sweetest fat you'll ever eat. Reminded me of foie gras. 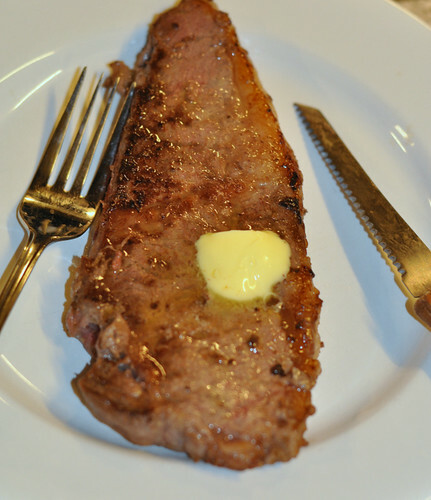 I didn't use butter to fry the Wagyu, so I decided to put a thin pat of butter on the cooked steak, which was totally unnecessary. Meltingly soft, tender, flavorful and sweet Wagyu. Coated by a black pepper sauce, this piece of Wagyu was wasted because I couldn't taste the full flavor of the meat with all that cream, pepper, shallots and wine. Unfortunately we forgot to take a photo of the real bite so this was re-enacted after the crab was half-cooked. You can see the small red puncture mark next to the tip of claw. My finger throbbed for hours after that. I was about 7 or 8 years old. My mom had left a basin of cloudy rice water and I didn't know that a crab had strayed into the water. My cries brought the neighbors and someone said the crab will never let go unless the thunder clapped. Someone finally took a cleaver and whacked at the poor crab, which struggled and dug into my finger with all its remaining strength. That pain is forever imprinted in my memory. For many years, there was a fine white scar along the side of my finger. The scar has since disappeared and I can't even remember which finger it was. That was a story my family has heard over and over and I never thought I would ever let myself be clawed by a crab again. Moments after telling my helper Vero that story, as we pulled off the plastic strings that tied each crab that we had already stabbed, I suddenly felt intense pain and looked at disbelief at the sight: my finger in the big claw of a crab, again! It was the memory of the previous experience that panicked me more than what was happening, because I never forgot the unbearable pain and the hopeless situation of getting the pincher off without enduring more pain as the crab tried to defend itself. We were having some close friends and my kids' cell leaders over for a barbie last night and the last item to go on the grill was crabs. We could've thrown them onto the grill and closed the hood but that was deemed cruel so we finally stabbed the crabs through the soft part of their middle but there were raffia strings to be removed. I underestimated the tenacity of the last 3 dying crabs in the sink as I reached in to remove the strings. So we had this situation where I was on my knees at the sink screaming with pain, and someone approached with a knife, another with a chopstick, and each time they came close, I tensed and the crab got terrified and dug deeper into my finger making me scream and tremble with pain which in turn made the crab dig even deeper. I felt blood rush to my face as I tried hard to keep still since any movement would panic my attacker. One thing I love about my Hub is his control of situations. We've been in jungle situations (haha, private joke), passport expired flight about to take off situation, lost dog found dog but the person whose house dog ran into wouldn't give him back to us situation, children lost in mall situations and so on but each time Hub rose to the occasion and handled everything smoothly. I always tell my girl to get a thinking man like her father and for the boys to be like their father. I shouted away those who came to help because the more the crab was threatened, the more he tightened his grip. I shouted for someone to boil water, hoping that we can slowly fill the sink with hot water so that the crab will faint or something. The frog in the increasingly warm water story came to mind. I was ready to wait all night, I just didn't want to have my finger dug deeper by a desperate crab in its final moments. Then Yi suggested pliers (thinking girl!) and Hub got a pair of small pliers, small enough to put in between the claw. Before I could stop him, Hero had swiftly plunged the pliers in between the claw and prised it open and freed my finger. Now that I am a veteran at crab bites, I can offer some advice on the matter. Of course, be careful when handling crabs even if they look like they are dead. Maybe the best way to still them is like how you handle lobsters--give them a hot bath (correction: ice bath). 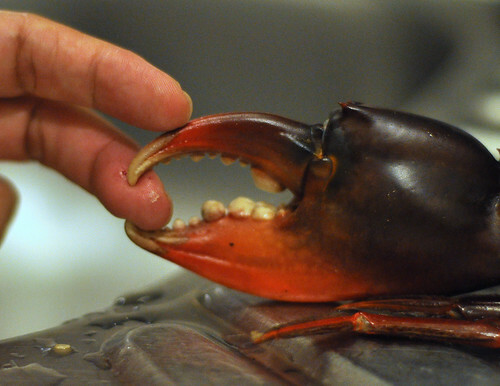 And if you ever get floored by a crab's claw, yield, do not fight. I suppose that's stupid advice because you'll learn soon enough not to move or startle the crab. The crab settles down after a while but each time you tense up or move, he'll grip harder. For bystanders, it looks like an easy situation but I can tell you if you are the one whose finger is bitten, it is pretty agonizing. I was telling friends that I was lucky that the crab last night had a large claw and the pain wasn't as intense as the other time because the larger claw had a blunt end while smaller, younger crabs have very sharp claws that can cut really deep into the flesh. But I later realized that the crab had been stabbed and wounded and it was weakened. If it wasn't, it could've dug through my finger because, like I said, it was a survival fight for the crab. I never looked the poor crab in its papaya-seed-like eyes. I was fighting for my finger but the crab was fighting for its life. My final advice? Don't handle crabs until you know they are really dead because if you don't have a Hero, you may have to wait until the thunder roars. My mom, who doesn't remember a lot of things, said, "What, again??" p.s. : CL, R, W, P and K, if you are reading this, you were right. There's never a dull moment in my house. You must be familiar with the Man Tai and Beaufort coffeeshop-restaurants we have in KK by now. These are great inexpensive places for a quick stir-fry dishes. A reader directed me to the New Man Tai at Open University shoplots (on Lintas Rd to the KKIA) and it has since become a favorite place for us on weekends. I like it because it is clean (meaning no litter on the floor) and not crammed with tables or people. The food is good and not as highly-msged and salted as other Man Tais, but watch out for the cha sao fried omelette, which sits in oil. 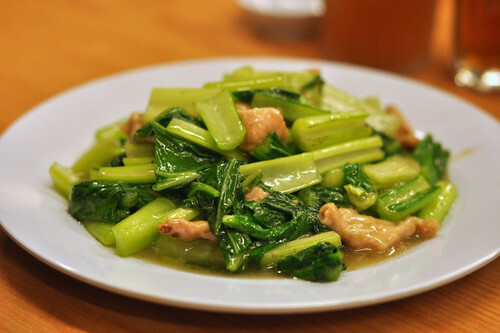 Stir-fried greens with pork, a Beaufort-style restaurant standard dish that has shrunk by half in all these restaurants. The costs of the veg and pork is about RM2 but this dish sells for RM8. 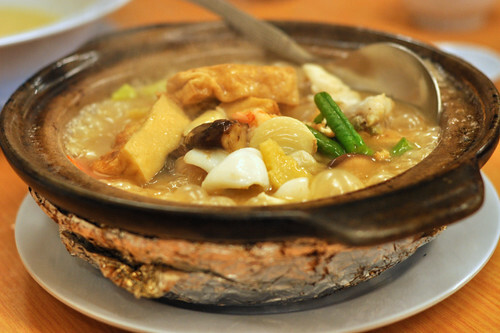 Seafood tofu clay pot, a dish that makes a dramatic entrance sizzling and hissing to the table. 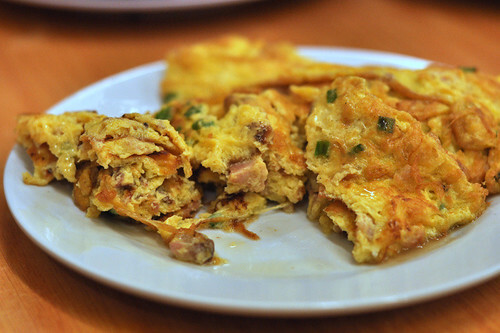 Cha sao omelette, very oily. Wey does a much better version, check his omelette out. 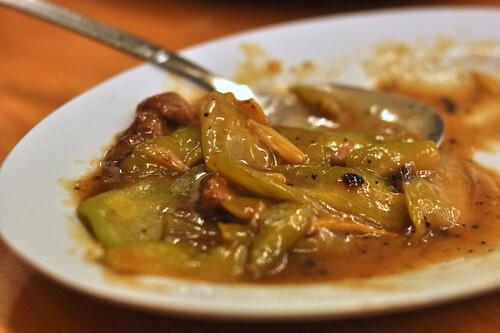 Bittergourd and beef slices with black beans. The bittergourd was overcooked. p.s I have cooked & posted 3 out of the 6 items above--click on the highlighted words.